Particle physics or animal cognition? Organized by Brian Hare and Charlie Nunn, 56 of us set out to design experiments that could measure the same cognitive traits – the building blocks of intelligence – in a huge variety of birds and mammals. Mikel Delgado contributed the data from Mongolian gerbils and fox squirrels – the latter being the only wild, free-ranging animals in this study. What we found: a) this worked! b) brain size predicted the ability to inhibit an impulsive response – which offers us insight into the evolution of self control. 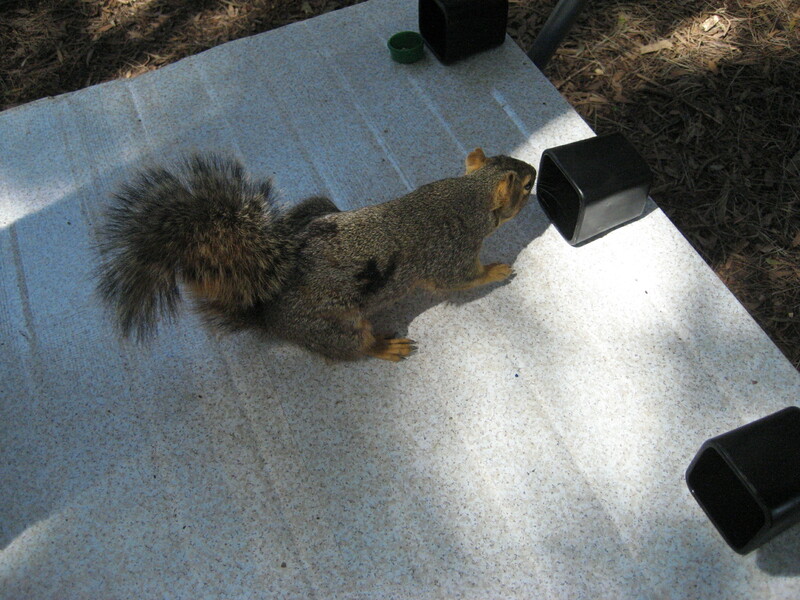 Here’s one of our squirrels working out the “A not B” problem and another squirrel working on the “Can I stop myself from trying to push my nose through clear plastic” problem. And here’s the list of authors! Evan L. MacLean, Brian A. Hare, Charles L.
Nunn, Elsa Addessi, Federica Amici, Rindy C. Anderson, Filippo Aureli, Joseph M. Baker, Amanda E. Bania, Allison M. Barnard, Neeltje J. Boogert, Elizabeth M. Brannon, Emily E. Bray, Joel Bray, Lauren J. N. Brent, Judith M. Burkart, Josep Call, Jessica F. Cantlon, Lucy G. Cheke, Nicola S. Clayton, Mikel M. Delgado , Louis J. DiVincenti, Kazuo Fujita, Chihiro Hiramatsu, Lucia F. Jacobs, Kerry E. Jordan, Jennifer R. Laude, Kristin L. Leimgruber, Emily J. E. Messer, Antonio C. de A. Moura, Ljerka Ostojić, Alejandra Picard, Michael L. Platt, Joshua M. Plotnik, Friederike Range, Simon M. Reader, Rachna B. Reddy, Aaron A. Sandel, Laurie R. Santos, Katrin Schumann, Amanda M. Seed, Kendra B. Sewall, Rachael C. Shaw, Katie E Slocombe, Yanjie Su, Ayaka Takimoto, Jingzhi Tan, Ruoting Tao, Carel P. van Schaik, Zsófia Virányi, Elisabetta Visalberghi, Jordan C. Wade, Arii Watanabe, Jane Widness, Thomas R. Zentall, Yini Zhao. (2014) The evolution of self-control. Proceedings of the National Academy of Sciences, 111(20), E2140–8. You can download the study as a pdf from our Publications page.